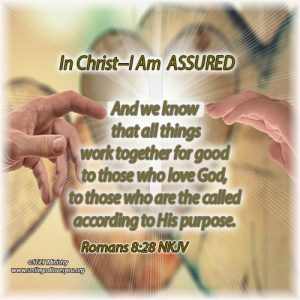 Believers, in Christ we are Assured that all things will work together for good for us because we love God and in Christ we have been called (appointed) according to God’s purpose. So this verse is basically telling us not to worry about anything that happens in our life, because God is telling us that He can work all things out for our good, no matter what. Since He has Appointed us to do His good works for Him, He will make sure that all we do will somehow turn out for good and bring Him glory. In other words, if He appoints us to do a job for Him, He will supply all that is necessary for us to complete it and if somehow the enemy comes around and messes things up, God will make sure that in the end it will still work out for good somehow. So in Christ, we can be Assured that God is in control of everything and we just need to focus on loving Him and doing what He has called us to do.